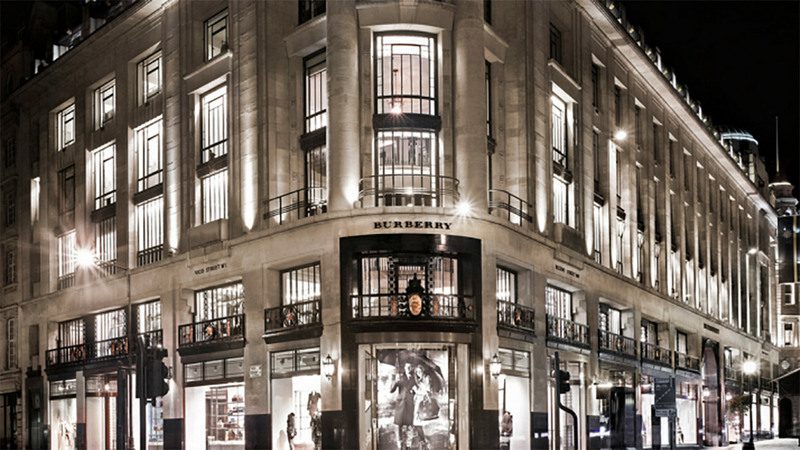 Burberry has launched a flagship store in London’s Regent Street, which merges the physical and digital worlds of Burberry in an engaging brand experience. The aim is to “seamlessly blur the physical and digital worlds” and at the core of this idea is the use of art and entertainment to enhance the Burberry brand experience across all channels. 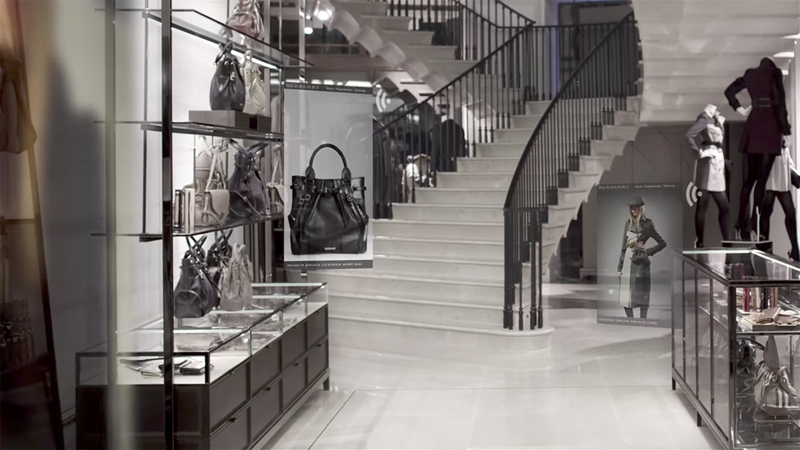 In a shocking twist the store, which Burberry calls “a celebration of British design and craftsmanship”, has been modeled on the Burberry.com site and was designed to be a physical manifestation of the online experience. Burberry.com is a beautiful site brimming with luxurious product imagery, rich storytelling, brand films, music, history, Burberry experiences and so much more. 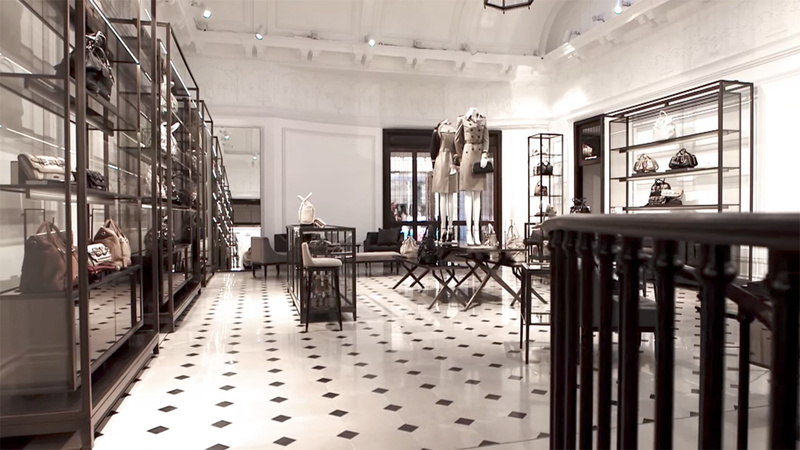 The space features all the shiny, stylish beauty you would expect from a Luxury store, along with all the latest coolest digital technology and brand entertainment that people have come to expect from Burberry. Featuring a 38 square metre screen, 420 speakers, a hydraulic stage, ipads and digital screens throughout the store, there’s also a gallery featuring the history and heritage of the brand. Products are tagged with RFID tags, which trigger content when touched or held by consumers – for example a handbag will launch a video about the craftsmanship behind the bag, while a dress taken into a change room may trigger a runway video. There’s also choreographed audiovisual takeovers such as a digital rain shower that sweeps across the store’s screens and speakers. “We’ve tried to choreograph it so that you have content specific to certain areas, but then all of a sudden the whole store turns into one rain cloud and makes you stop and smile,” said Bailey. The aim for the store is to give people a place to hang out and experience and explore the brand, Burberry also plans to host gigs in-store and has already hosted its London Fashion Week show in the space. Luxury brands have long faced the tough challenge of how to translate the special and unique experience of the Luxury brand and its retail environment into the online space. For these brands the retail experience is as important, in some cases arguably more important, than the actual products. From the storefront, to the way customers are greeted, the scent, the sound, the look, touch and feel, the staff, the customised service, the purchase process it all combines to create a unique brand experience that will keep you coming back. Since the arrival of the internet and the ever increasing popularity of the online retail experience, the major question all brands – but perhaps most pertinently luxury brands – have wrestled with is how to recreate these experiences in the online space? Burberry, however, is not one of those brands. The site is a collaboration between the brand and a host of leading photographers and style gurus including Scott Schulman and Magnum photographers as well as customers who are invited to upload their own pics. 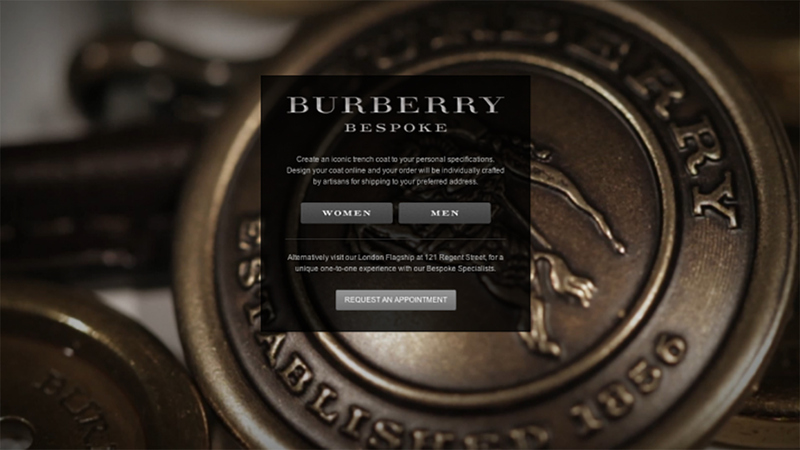 Burberry moved quickly and fearlessly into creating an online brand experience that was aligned and complimentary to the physical brand experience. And key to this strategy was arts and entertainment. From The Art of the Trench to the many brand films hosted on Burberry.com and its YouTube channelto the Burberry Acoustic stream, which sees brands create dedicated acoustic performances for the brand. Burberry’s strategy to create an authentic online brand experience has been completely reliant on the use of brand created content. So it is fitting now to see the brand has come full circle to seamlessly merge this online world back into the physical through this flagship store. There’s no mistaking that Burberry has created an immersive brand experience. It is also a masterclass in how to bring transmedia ideas to life. For Burberry the brand is completely transmedia. Everytouch point sings from the same songbook, while each presents a different part of the story. From the products to the advertising, to its music credentials, to the website and now its physical retail presence, Burberry lives and breathes storytelling – even its press releases. link. Burberry’s fearless embrace of the digital world and of the creation of branded arts and entertainment has also enabled the brand to redefine its image in the luxury marketplace. In the last decade the brand has been transformed from a tired brand loved by “chavs” into an edgy luxury brand. Burberry’s flagship has reinforced the edginess the brand is keen to reinforce. First in employing a strategy which proudly and blatantly champions the digital space, a place many luxury brands still fear. Secondly through the location and positioning of the store, situated on the busy tourist laden Regent Street it is a deliberate move to make the brand more accessible to a younger audience and a wider audience. Shifting away from more shiny, and stuffy locations such as Knightsbridge or Bond Street, This store becomes more like the Apple experience located up the road, a place to explore, experience and hang out. Burberry’s fearless strategy to invest in creating entertainment and a focus on ensuring the brand is cultural relevant, have transformed it from a stuffy luxury brand to a modern, relevant and very hip Luxury brand. The pay off will be a young edgy audience that is transfixed by the brand and loyal. The store itself is a work of digital art. Creating a retail space that at any moment could explode into a spectacular digital experience is impressive. The rainstorm experience is a genius creation merging art and commerce for a brand whose most iconic product is a raincoat. There’s also the savvy move to create ‘mass customisation’ with Burberry Bespoke, where customers can create a made to order trenchcoat, which is available instore and online. Customers can choose colour, style, materials, buttons, lining and with a final special flourish have their initials sown into their custom coat. The strategy is solid. 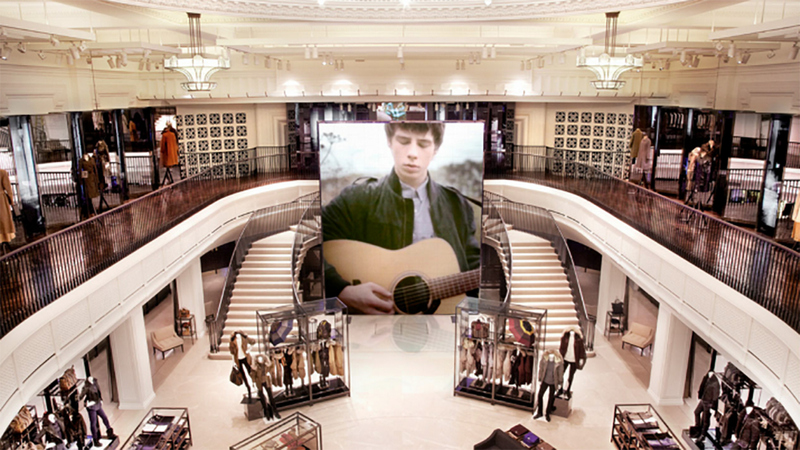 Burberry has created a space to bring to life all the elements of the brand, while fusing the physical and digital. From the music of Burberry Acoustic to the brand storytelling through the gallery, brand films, product films, marketing films, the Art of the Trench, the brand experiences such as Burberry Bespoke, this is a living breathing testament to how to bring transmedia to life in a relevant way. 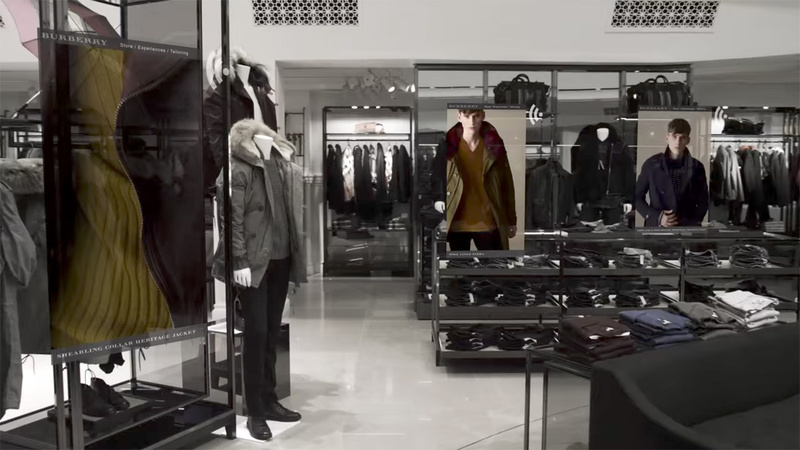 Burberry has not created a retail space, they’ve created an immersive transmedia brand experience. This is a masterclass in how to create a seamlessly integrated brand experience.